Photograph by Vatey Uy. TEDxScottBase Creative Commons. This was not the first time a TEDx series has been recorded in Antarctica; “TedXAntarcticPeninsula” was held at Neko Harbour (64°50’S, 062°33’W) in March of 2012 and addressed the theme of “renewable energy.” What made #TedXScottBase different was the involvement of New Zealand’s National Antarctic Programme, and the high profile associated with the Scott Base’s 60th anniversary. Talks were pre-recorded in the Antarctic, then streamed at three times to make them accessible to viewers in a range of time zones. (Scott Base, incidentally, runs on New Zealand time, as does Amundsen-Scott South Pole Station at the geographic South Pole). The delayed broadcast also allowed for the event to be promoted on social media, with teasers of the speakers experiencing the ice appearing in the lead up to the main event. Although most people will never go to Antarctica, they do carry an imagined version of the place, assembled through a range of cultural production such as books, films, photographs, podcasts, and online media. That online platform is increasingly powerful; games such as Ice Flows and Minecraft Antarctica have made Antarctica relevant to a much wider (and technologically savvy) audience. With recent reports suggesting that the number of people visiting Antarctica is unsustainable, it is becoming more important than ever to find new, less invasive ways for the public to connect with the continent. #TedXScottBase series offers one way of sharing understanding with a wider audience, and of bringing the continent to the attention of those in a range of far away places. Antarctica may be remote, but it plays a vital role in the earth’s climate system. Processes in the far south help drive ocean currents around the world, while the spectre of sea level rise makes the polar regions all too tangible for those living in low lying areas. As geophysicist Christine Hulbe put it, if you’re living by the ocean, the difference between 3cm sea level rise a year and 6cm sea level rise per year is not your main concern. Professor Gary Wilson of the New Zealand Antarctic Research Institute addressed the topic of climate change with the message that together we are powerful: “no one country is going to solve it on its own. It’s going to take each and every one of us to make a difference,” while entrepreneur Claudia Batten talked through new, non-linear ways of approaching life in a time when “change is our constant.” Including a range of speakers from very different backgrounds helped it to appeal to a broad audience, while the variety of speakers also opened up different ways of looking at Antarctica, through the lenses of history, science, music, business, and even, thanks to astronaut Dan Barry, from outer space. The desire to help people forge a connection with Antarctica was at the heart of the event; musician Gin Wigmore urged viewers to “try to have a relationship with Antarctica… treat it like a family member.” She went on to lead by example, addressing Antarctica directly: “You’re so big and awesome, you’re a badass continent,” and one that stays up really late to boot. As local media reports show, #TedXScottBase also offered the opportunity to raise the profile of Antarctica amongst New Zealanders. It is no coincidence that the event was described as a celebration of both “the 60th anniversary of the construction of Scott Base and New Zealand’s permanent presence in Antarctica.” New Zealand is one of seven claimant nations in Antarctica, and although the Antarctic Treaty of 1959 (Article VI) effectively put a “freeze” on all claims, the Ross Sea Region has continued to be referred to within New Zealand as “Our Far South.” The #TedXScottBase event offered a platform to showcase current research from Antarctic scientists (such as Christina Hulbe, Gary Wilson, and Craig Cary), offer novel ways of looking at the continent (thanks to artist Jane Ussher and film maker Anthony Powell), and highlight New Zealand’s ongoing presence in the region. Whether or not this will translate into a greater interest in Antarctic and climate science, both within New Zealand and beyond, remains to be seen. What is certain is that this #TedXScottBase event reached a much larger and more global audience than those associated with any other anniversary. Recordings of the talks provide an ongoing showcase of Antarctic projects, as well as a snapshot of how the continent is thought about in 2017. 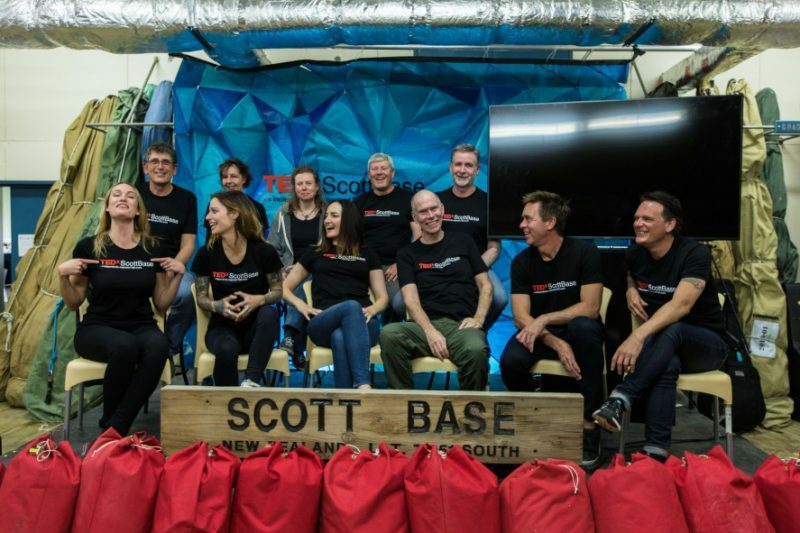 The event was designed to continue to spark conversations, and the hashtag #TedXScottBase has already seen a range of reactions shared in the public sphere. On January 22, #TedXScottBase was trending number 1 in New Zealand, and tweets were coming in from viewing parties all over the world. When the questions being posed are “how can entertainment save our planet?” (Ashlan Gorse Cousteau) and “who are we as a species, and what do we want our world to be?”(Jeremy Moon), formulating an answer will take some thought and much discussion. How do we bring Antarctica to the heart of such conversations? In many ways, it is there already, and it just takes a few carefully crafted words to point out the connections between ice and the everyday. When it comes to giving a large number of people the opportunity to experience Antarctica, digital technology offers a novel and accessible way forward. And, as the big “60” associated with the #TedXScottBase event reminds us, it’s never too late to start exploring. Hanne Nielsen serves as an Expert within the Arts, Culture and Heritage Unit at Polar Research and Policy Initiative. She is currently completing her PhD at the Institute for Marine and Antarctic Studies (Tasmania, Australia), where she works on representations of Antarctica in advertising, and holds a Master of Antarctic Studies from the University of Canterbury (Christchurch, NZ). She lectures and tutors in Antarctic Studies at the University of Tasmania, and is the communications assistant for the Southern Ocean Observing System (SOOS). Hanne also works as a tour guide on Antarctic cruise ships during the southern hemisphere summer season, is currently the Vice-President of the Association of Polar Early Career Scientists (APECS) and an Executive Committee member of the SCAR Humanities and Social Sciences Expert Group. Hanne’s research interests include representations of the polar regions in literature, film, and cultural production; the commercial history of Antarctica; and polar tourism.